As much as I’d like to blame a lost wager on this ridiculous headband I wore to a Skid Row concert three years ago, I must confess the frilly malfunction was nobody’s fault but my own. Hell, even the hair-metal Skids knew the ‘80s were dead and gone! What the Bach was I thinking? Despite the garter-gone-wrong (were my other bandanas away at the dry cleaners? 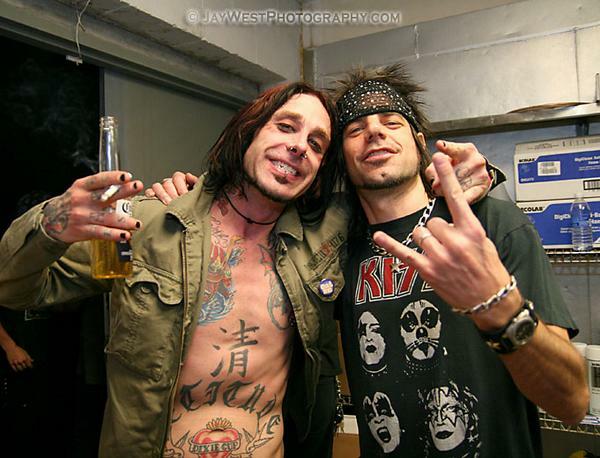 ), I still love these photos taken by my friend Jay West during Skid Row’s post-show backstage party at Rock City Ice House in Austin, Texas 2008. Of course, Sebastian Bach was nowhere to be found as he was long ago replaced by Texan homeboy Johnny Solinger, who did a great job singing the hits. As you can see from the photos, Jay has a great eye for light and color, which gives these photos their “pop” factor. And yes, guitarist Scotti Hill is every bit as loony as he appears in the picture at the top of this page. Completely hilarious! Drummer Dave Gara (above) was another nutcase who also happens to be a fan of my friends, the B-Movie Rats, which gave us plenty to talk about. 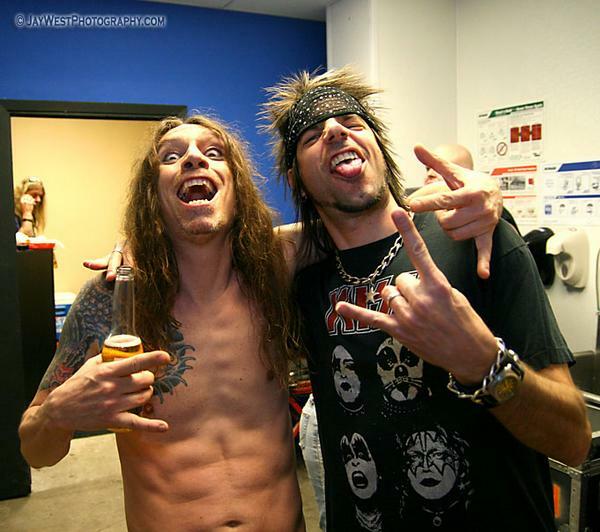 As for Solinger, he completely surprised me by saying he knew all about “Metal Dave” before we were even introduced (maybe news of star-spangled fashion disasters gets around quickly?). As a fan of Skid Row (partial to Bach, but respectful of Solinger), I had a great night partying with the band. As a new father (my son was born 10 days earlier), I also enjoyed a heightened level of giddiness as all my friends and the Skids asked about my newborn baby boy. Perhaps most importantly, however, I left the gig with these great souvenir photos that serve to remind us: Friends don’t let friends wear Britny Fox headbands!